SmartLock Pro is an extremely cost-effective, entry-level system utilizing single door controllers and very easy-to-use software with an “Outlook” style interface. The system is capable of controlling access to 60 doors and 4800 users and has all the functionality required for simple applications. SmartLock Pro supports Proximity, iButtonTM or Zodiac Biometric readers as well as industry standard 26 Bit Wiegand formats so it can be used with virtually all reader technologies on the market. Up to two controllers can be mounted in a single SmartLock cabinet with a DC power supply and backup battery. Each controller is equipped with three Form “C” relay outputs. One to control an Electric Lock, and two additional outputs that can be configured to control a Power Door Operator, and/or provide a means to annunciate Forced Entry/Door Held Open conditions. Inputs are also provided for an Egress Button, a Door Operator Button and a Door Contact. When the Door Contact Input is connected, the reader will automatically relock the door once it re-closes. In addition, an audible alert can be generated if the door is held open longer than a specified time. If controlled egress is desired, an Exit Reader can be connected that is audited separately. 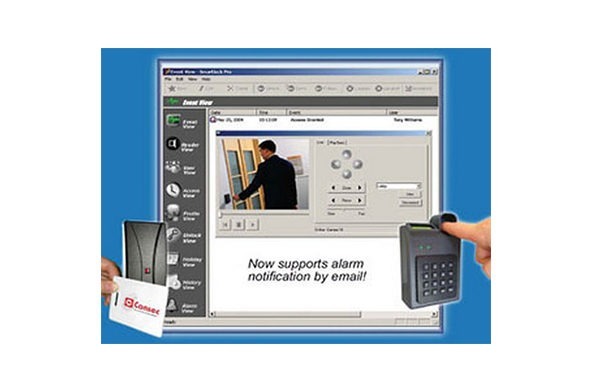 Voiding and validating cards is easily accomplished using FREE SmartLock Pro Software. This intuitive application is so easy to use, it can literally be mastered with just 30 minutes of instruction. The administrator sets up the cardholder database on the PC utilizing programmable Access Schedules and Access Profiles. 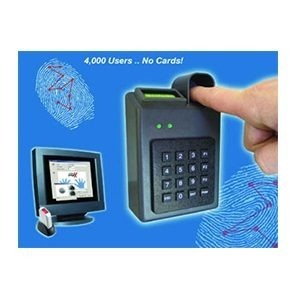 The Access Profile defines the readers and time intervals that the user is allowed access. Within each cardholder record, the administrator simply links an Access Profile to the user. For example, a user may be assigned a “Manager” profile which grants access to all readers at all times. When any programming changes are made, they are instantly transmitted to the door controllers. As reader transactions occur, they are automatically transmitted and stored on the PC for viewing at any time. The software also provides the ability to program/deny access during any of the 60 programmable Holidays. An “Unlock Privilege” may also be granted to cardholders on an individual reader basis. This feature allows selected cardholders to maintain doors in an unlocked state by using their card twice in rapid succession. To relock the door, any cardholder with “Unlock Privilege” simply uses their card again twice. The software also provides the ability to issue Unlock, Relock, and Temporary Unlock commands to one or multiple readers simultaneously. Unlock Schedules can be programmed to unlock and relock doors automatically. The “First Man In” feature can also be used in conjunction with Unlock Schedules to prevent doors from automatically unlocking without prior entry of an authorized user. A “Lockout” feature allows a reader to be disabled so that no cardholders can unlock the door. This is very useful for preventing access to a hazardous area in the event of an accident. SmartLock Pro also supports a Timed Anti-Passback feature. Each controller can be programmed with a time interval from 1 to 255 minutes that will deny access to cards which are used more than once during the interval. This deters cardholders from “passing back” their card, particularly in parking applications. 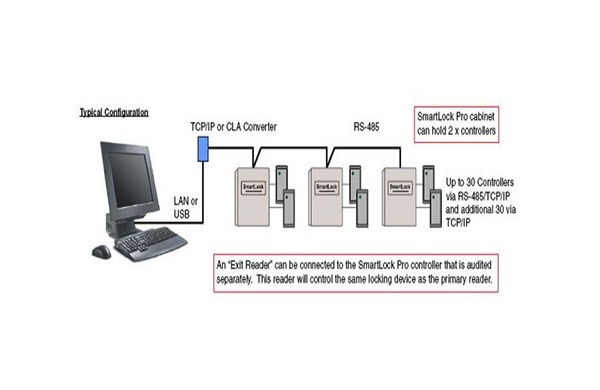 SmartLock Pro controllers can also communicate via LAN/WAN using Cansec’s CanLan TCP/IP Controller. This built-in functionality simplifies remote management and can greatly reduce the installation cost associated with a hard-wired system. SmartLock Pro comes standard with DVR Integration. This powerful feature allows operators to view live video from cameras connected to the DVR as well as search for video based on time & date directly within SmartLock Pro software. However the biggest benefit of the DVR integration is the ability to link audit trail from access controlled doors to video from DVR cameras. The system operator simply double-clicks the audit trail transaction with their mouse and the associated video will stream and play directly in SmartLock Pro. Check www.cansec.com for supported DVRs. 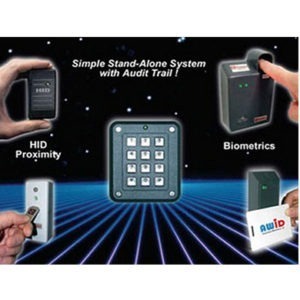 SmartLock Pro’s user-friendly interface and low cost make it the ultimate system for simple access control applications. SmartLock® is a registered trademark of Cansec Systems Ltd.